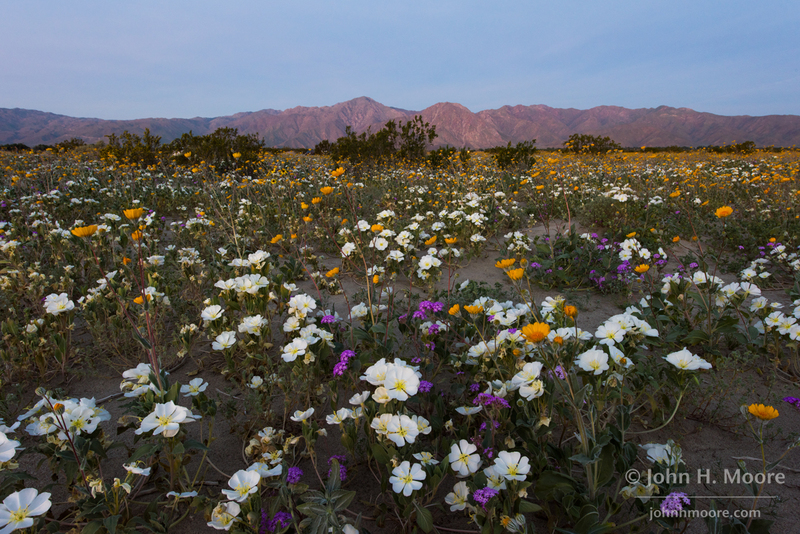 As completely overrun as Borrego Springs has been since the news started running stories about a “Super Bloom,” I hadn’t planned on heading back out to the desert again until the hype was over. However, Friday night a friend got in touch to say that the bloom of dune evening primrose had exploded in the past week. The friend has a bit of a thing for primroses… and because I’ve learned much from him over the years, I kind of do, too! They are very photogenic. A week ago, sunrise was at 6:00 AM and I got up 90 miles away in San Diego at 3:00 AM on a weekday–to avoid the weekend traffic and be there well before sunrise. This trip on Saturday was definitely not a weekday, and the change to Daylight Savings Time made sunrise about 7:00 AM, but this time I was up at 2:45 AM for the long, dark drive. The fog was thick and scary until Highway 67 turned east. To my complete dismay, I arrived at 4:45 AM out at the east end of Henderson Canyon Road–that’s more than two hours before sunrise–and there were already a dozen cars there! I didn’t encounter any other people, however, until around sunrise… so they may have all arrived the night before and been sleeping. 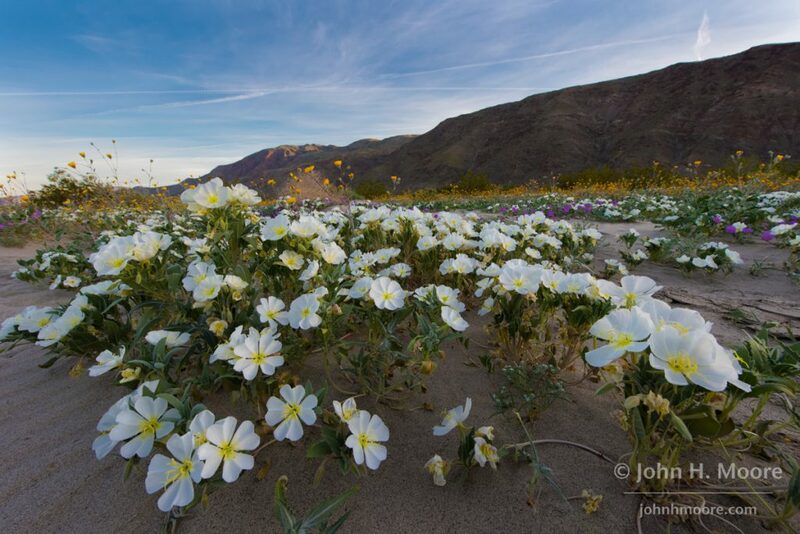 The dune evening primrose had indeed exploded and were gorgeous. As were the rest of the flowers. Things were only mildly trampled, and not yet too much burnt from the sun. But between the sun and the caterpillars, I doubt this bloom will last too much longer. 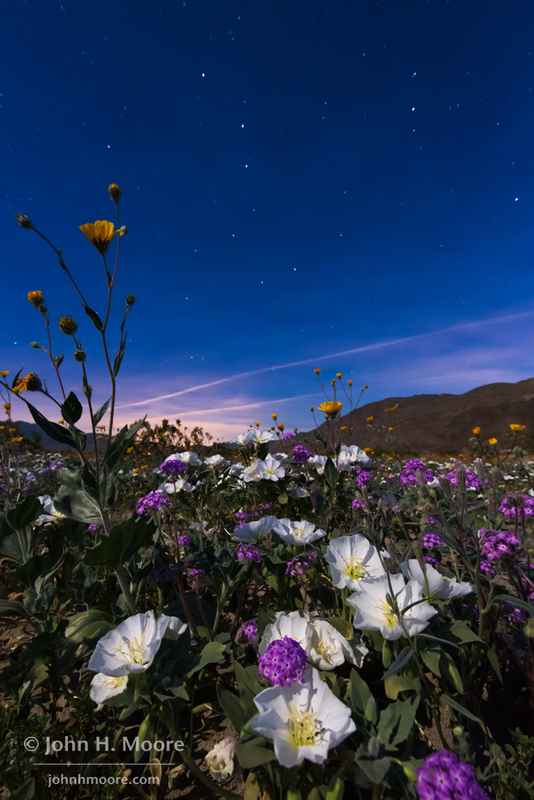 The Big Dipper watches over a field of wildflowers at Anza-Borrego Desert State Park. 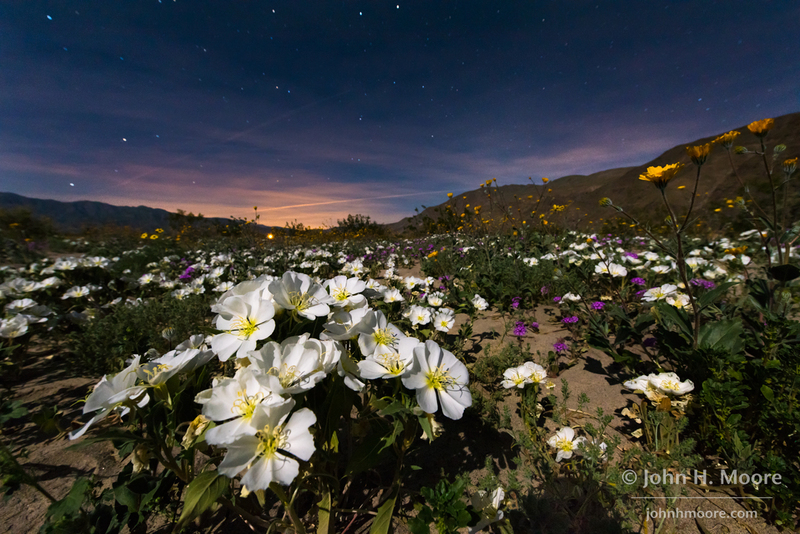 Night sky over dune evening primrose in Anza-Borrego Desert State Park, California. 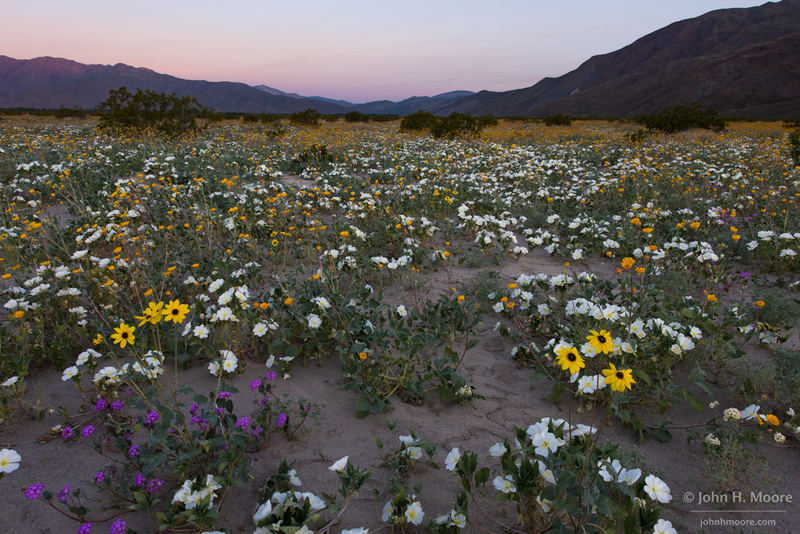 Wildflowers at sunrise in Anza-Borrego Desert State Park, California. 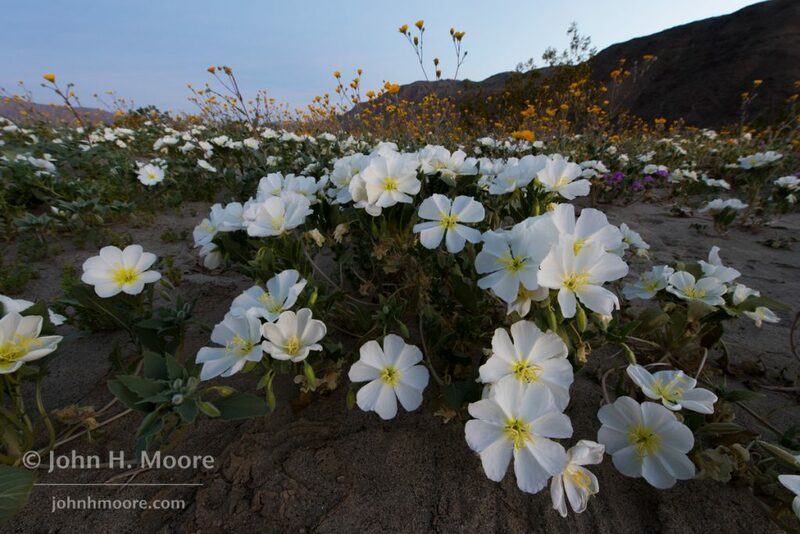 Dune evening primrose at Anza-Borrego Desert State Park, California. Dandelions mix with dune evening primrose, desert sand verbena, and desert sunflowers off Henderson Canyon Road in Anza-Borrego Desert State Park, California. 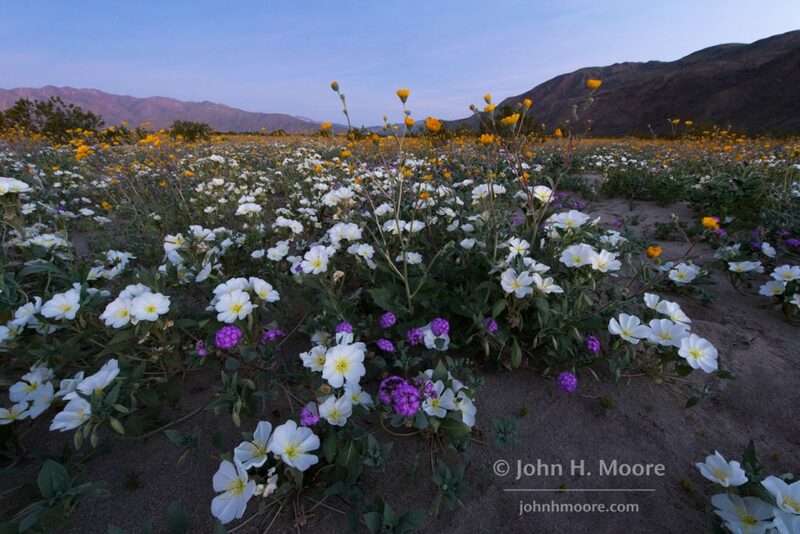 Dune evening primrose and other spring wildflowers at sunrise in Anza-Borrego Desert State Park, California. 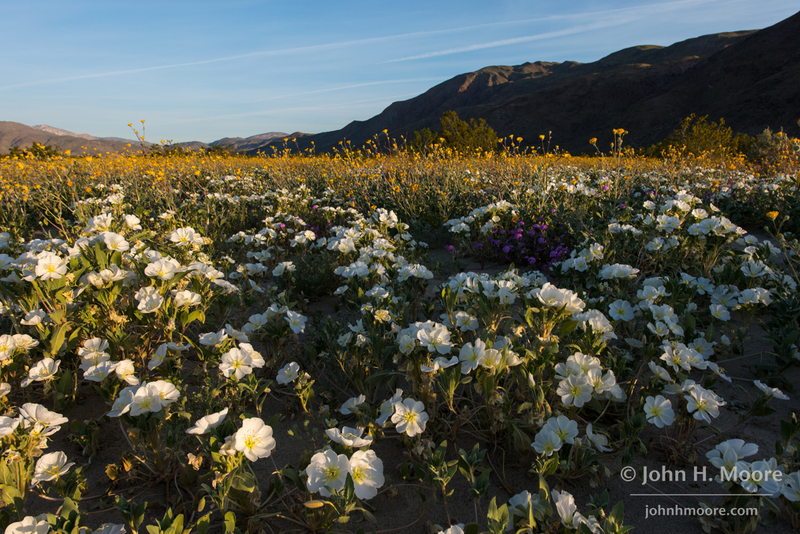 Sunrise light on the mountains of Anza-Borrego Desert State Park behind fields of spring wildflowers. 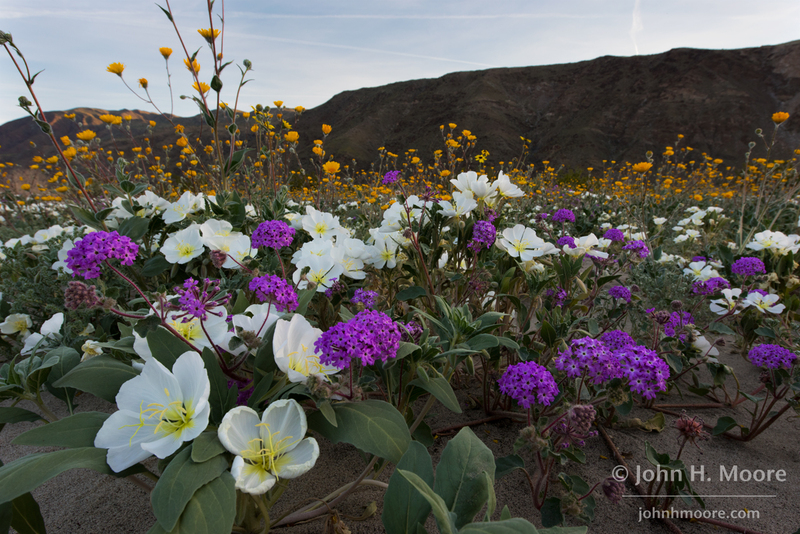 Dune evening primrose mixed with other spring wildflowers at Anza-Borrego Desert State Park, California. 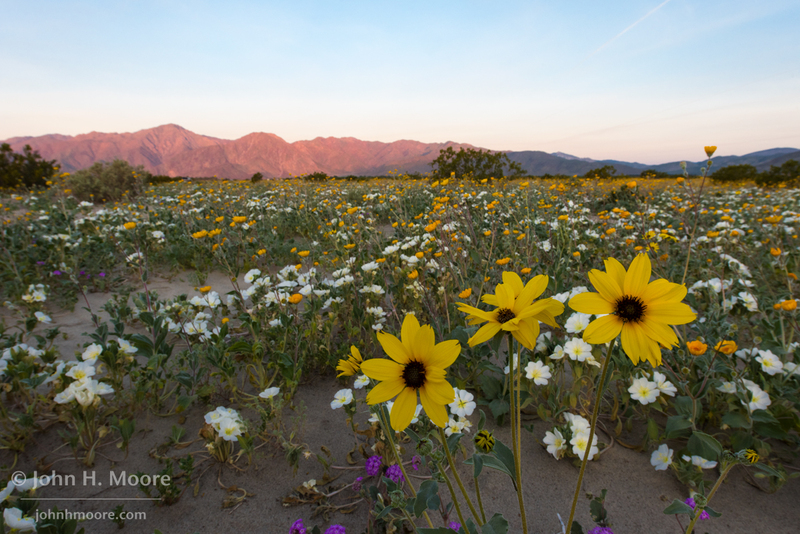 Desert sand verbena mixed with desert sunflowers and a sea of dune evening primrose behind. 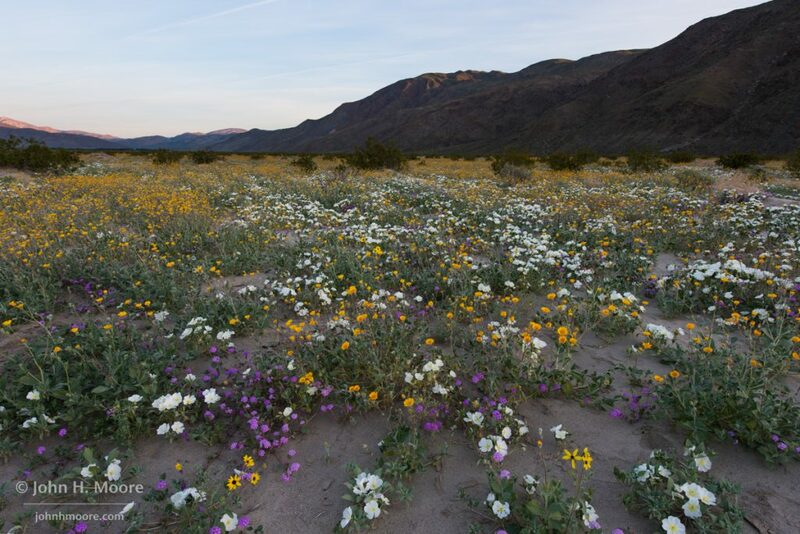 Anza-Borrego Desert State Park, California. A field of dune evening primrose greet the morning sun in Anza-Borrego Desert State Park, California. 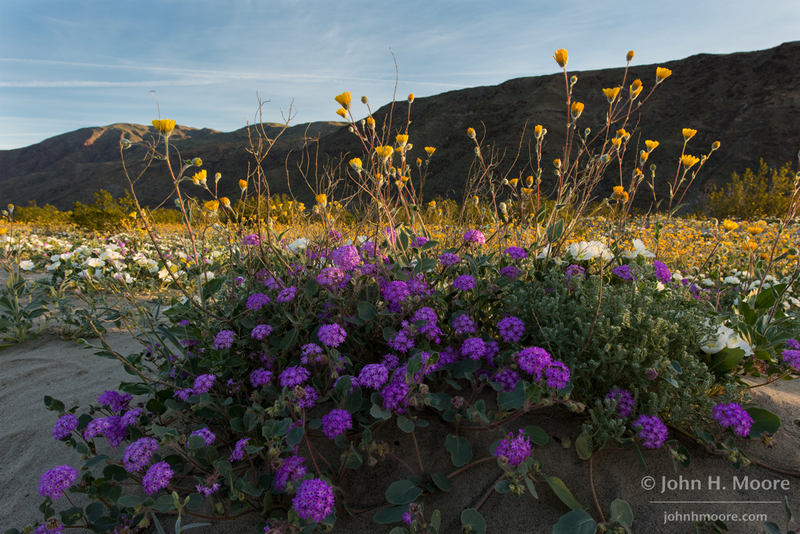 Mixed wildflowers at sunrise in Anza-Borrego Desert State Park, California. 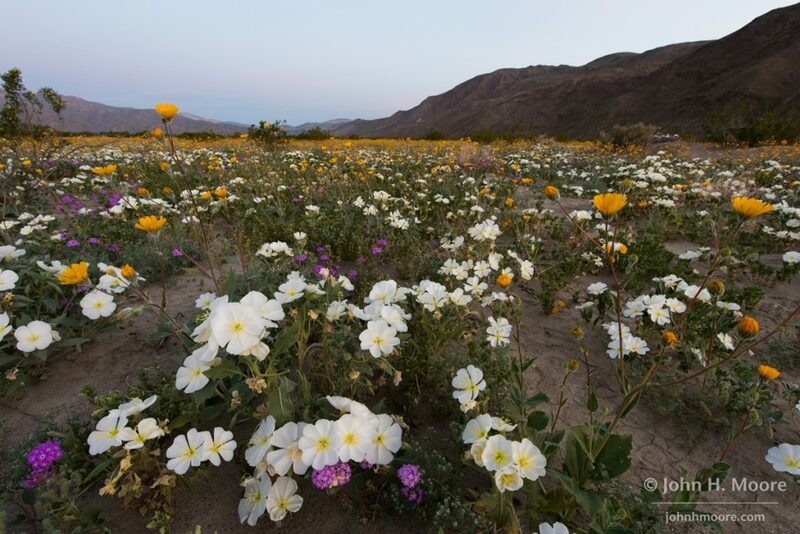 Dune evening primrose, desert sand verbena, and desert sunflowers off Henderson Canyon Road in Anza-Borrego Desert State Park, California. 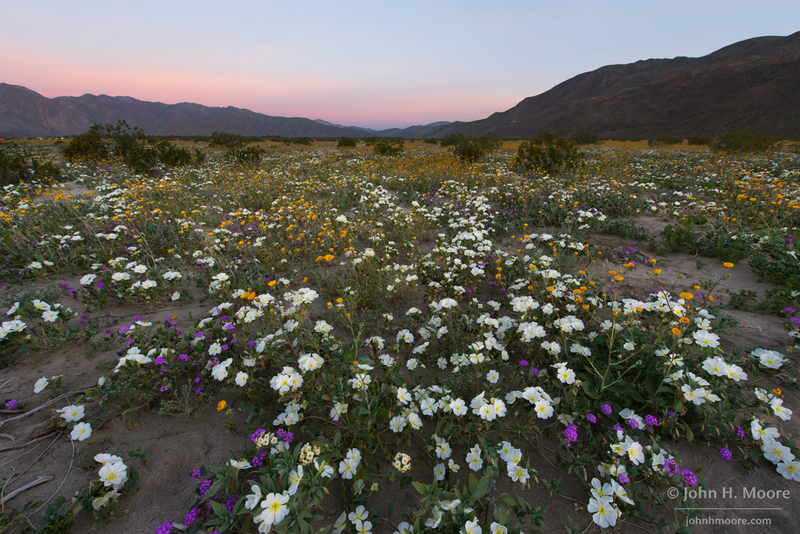 Dandelions greet the morning sun in Anza-Borrego Desert State Park, California. This entry was posted on March 19, 2017. It was filed under Uncategorized. Oh my God, it is a breath taking beauty, especially picture showing big dipper. Words fail me. This is so spectacularly beautiful especially given the usually barren nature of these lands. Sweet for the eyes and soul.